Joe Karaganis stories at Techdirt. stories filed under: "joe karaganis"
To a large extent, our work on Shadow Libraries started where Media Piracy ended, with the confirmation that the main factors underlying high rates of piracy in the developing world were the obvious ones: high prices for legal media, low incomes, and the continued diffusion of cheap copying technologies. As everyone from [Sci-Hub's creator] Elbakyan to Elsevier knew, however, Sci-Hub's importance was not its permanence as a service but its status as a proof of concept. Its core archive of fifty million articles was freely available and its basic search and archive features easily replicated. If Elbakyan's story has struck a chord, it is in part because it brings this contradiction in the academic project into sharp relief -- universalist in principle and unequal in practice. Shadow Libraries is a study of that tension in the digital era. catching the moment of widespread digitization of materials and related infrastructure but not yet the digitization of the wider teaching, learning, and research ecosystem, and not the stabilization of legal models and frameworks that can keep pace with the growth of higher education and the global scale of emerging knowledge communities. this informal copy culture is shaped by high prices, low incomes, and cheap technology -- and only in very limited ways by copyright enforcement. As long as the Internet remains "open" in the sense of affording privacy and anonymity, shadow libraries, large and small, will remain powerful facts of educational life. As in the case of music and movies, we think the language of crisis serves this discussion poorly. This is an era of radical abundance of scholarship, instructional materials, and educational opportunity. The rest is politics. Those are points we've made here on Techdirt many times before. We are enjoying an era of unprecedented digital abundance, which the copyright industries are fighting to shut down in order to preserve their outdated business models based on scarcity. One way they try to do that is to attack the Internet's openness by striving to weaken privacy and anonymity online, regardless of the collateral harm this causes. The importance of shadow libraries in global higher education is another reason to resist that. 56% of people surveyed oppose government involvement in blocking access to infringing material. This number increases to 64% when the term censor is used. Furthermore, when asked specifically if ISPs, social media sites and search engines should block access to infringing content if it also meant that some legal content would also get blocked (basically the definition of SOPA -- where even the defenders of the bill admit it will block some legal content), only 36% say that's an acceptable form of copyright enforcement. 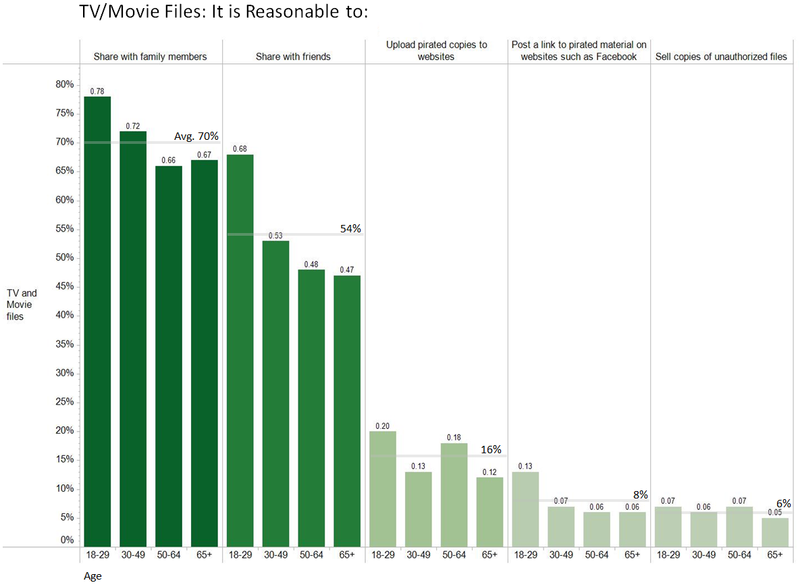 In other words, a majority Americans are very opposed to the methods and impact of SOPA. 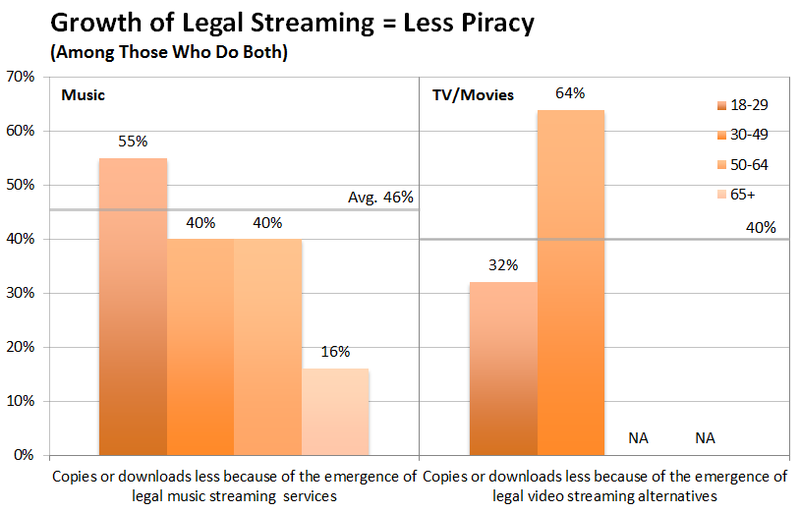 Only a slim majority of Americans (52%) support penalties for downloading copyrighted music and movies -- and limit this support to warnings and fines. 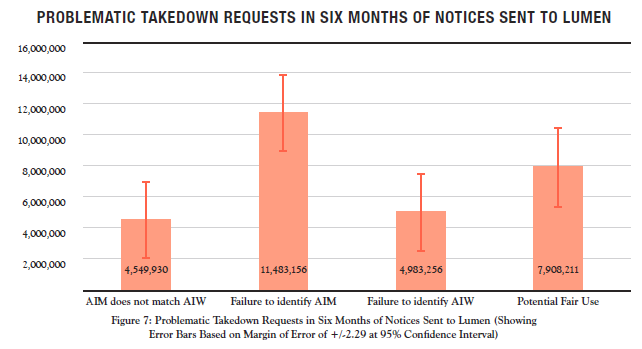 Other penalties, such as bandwidth throttling and disconnection, receive much lower levels of support. Disconnection from the internet, in particular, is very unpopular, with only 16% in favor and 72% of Americans opposed. 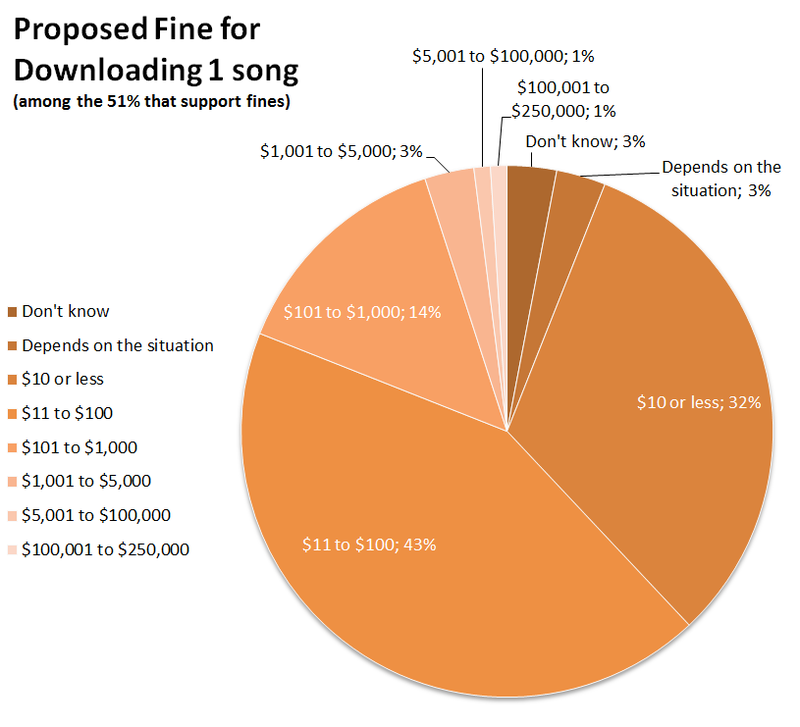 Among those who support fines, 75% support amounts under $100 per song or movie infringed -- hugely undershooting the current statutory penalties. For a majority of Americans (54%), due process in such matters requires a court -- not adjudication by private companies. Solid majorities of American internet users oppose copyright enforcement when it is perceived to intrude on personal rights and freedoms. 69% oppose monitoring of their internet activity for the purposes of enforcement. 57% oppose blocking or filtering by commercial intermediaries if those measures also block legal content or activity. So what is there to make from all of this? It appears that our current laws (especially statutory damages) are way out of line with what the majority of Americans think would be appropriate. Furthermore, a ton of people infringe regularly, and especially think nothing's wrong with sharing among family and friends. On top of that, they seem to agree that enforcement is way out of line with the "problem," and certainly don't approve of the types of changes that SOPA is seeking to put in place. So why are so many in Congress so out of touch with the American public and so focused on passing a law that goes against the wishes of Americans? This is the question Congress should be answering at tomorrow's hearings. The report's author, Joe Karaganis, should be one of the witnesses testifying, rather than a bevy of industry representatives all trotting out unsubstantiated reasons for moving forward with SOPA.